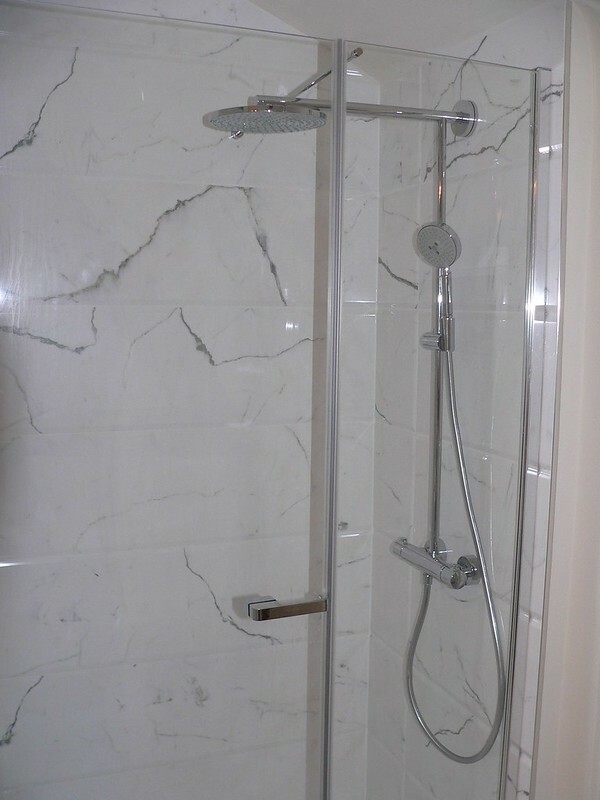 The sloping ceiling forms part of a small shower enclosure, it will get wet when we use the shower so tiles seem the best solution as the rest of the shower will be tiled. I take it mosaic panels behave differently to a normal tile? Thanks for everyone's help, that's really helpful. We also have sloping ceiling in our shower cubicle but it never gets wet. Why would it? Showers go down surely ? With mosaics being supplied on a mesh backing you can guarantee the entire panel is pushed into the adhesive, with large tiles that is not always the case as it relies on the wall being perfectly flat which is rarely the case. Perhaps the sloping ceiling is uneven which is why mosaics have been recommended? If the substrate can take the weight of the tiles, and it should be able to, then you should be able to use the bigger tiles. I don't know why you have been advised otherwise, perhaps they think the tiles will come away before the adhesive sets, but if you use the right adhesive tiling a sloping ceiling should not be a major problem. Why do you think you need to tile the sloping ceiling? We didn't and it's all fine after many years. Hi, I'm installing an ensuite with shower in a room with sloping ceilings (roughly 48 degree slope). I think I need to tile the sloping ceiling in the actual shower to stop it getting damaged. I bought porcelain tiles but have been told these are too heavy for the sloped area. I have been told that a mosaic version of the same tile will be ok, but it's more or less the same weight as the original tile so I'm unsure if this is actually ok. The mosaic is 297x297mm and 1.6kg/sheet (11 sheets per sqm = 17.82kg/m2) vs the plain tile which is 326 x 326mm and 17.86kg/m2. They are tiling onto marmox board. I'm seriously thinking of returning the tiles and using 200x100 ceramic metro tiles instead. Any advice would be great. Thanks.